Handle your handguns with ease and feel safe while carrying when you choose our gun safety course. Backed by 30 years of experience, we offer classes that cover everything from the fundamentals to advanced proficiency training. From first time shooters to experienced gun owners, our courses have something for everyone. If you would like to gift someone a class click here. Learn the basics with our hands-on, fundamental training course. This course demonstrates how to handle, load, and unload a pistol. Stay safe in any environment with our LTC training course. During this class, we go over relevant laws and nonviolent conflict resolution. Edward Williams founded E&S Gun Safety Training, LLC, as a way to help individuals learn how to shoot. A retired veteran with over 26 years of Army service, Edward combined his handgun expertise with his customer service skills to create an all-inclusive gun safety course. Today, he draws on his abilities and patience to teach all aspects of handgun training. 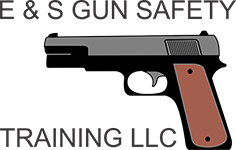 Our ultimate goal is to help you feel safe and comfortable while handling your handgun. While our classes are generally held at the Arlington, TX, Homewood Suites, we can also come to your home, office, or the location of your choice. We're available to go wherever you need us; we'll even travel to different cities. Give us a call to discuss custom locations or to sign up for our pre-scheduled classes. Ask us about our friends and family discount! Please check out our specials for classes.